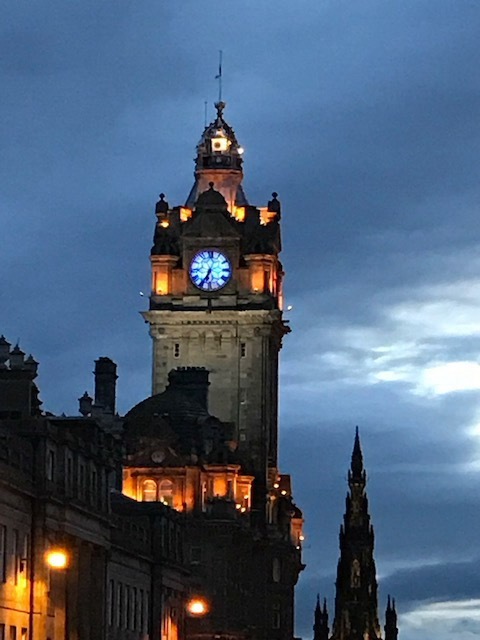 The clock tower of The Balmoral is a compass point in the Edinburgh skyline. The illuminated clock face tells revellers the hour of the night, whether it is early or late. John Ortburg* once wrote that we need to be wise in filling the squares of the calendars that make up our lives. Too often they get filled with commitments that won’t mean much a year from now, let alone ten or a hundred years from now. The most important thing to put in the squares is God. “Seek first the Kingdom of God”, Jesus said, and see how well everything else in your life falls into plac: your personal and family life, work and social life. The older I become the more I see His wisdom. The second thing that we need to fill our calendars with is People. Many years ago I added the spiritual discipline of not only planning the next day but saying a little prayer. “Lord, I know what I have planned but I don’t know what You have planned. Let me be open.” Then, I would not see others not as an interruption but as a possible glimpses of God’s grace. Time invested in others is time well-spent. The third item is Joy. Jesus told His disciples He came to plant God’s joy in their hearts. (John 15:11) Too many followers of Jesus are joy-challenged. I may be in that number more often than I wish to admit, but I am working on changing that. Relax. Meditate. Go see a funny movie. Push a child on a swing or, better yet, swing with them. We only get one chance at life. My glimpse of grace for today is this, Seek first the Kingdom of God, Invest in others, and add Joy to your life as well as to others. After all, we’re running out of time.